My biggest problem with Jesus in John’s gospel, one I sensed in my distant youth as a critical Bible student, is that he simply isn’t real. 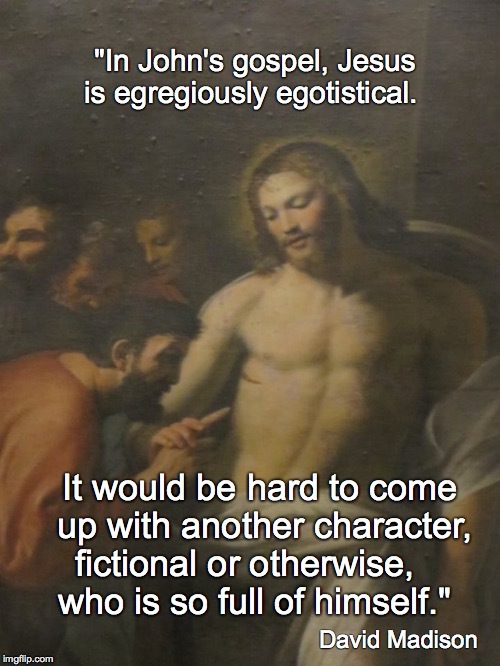 Jesus here is an artificial, contrived figure—a tediously written, poorly developed character in an inferior novel. 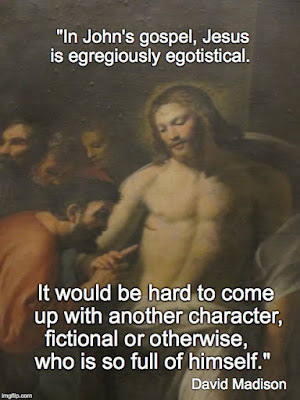 But if we grant that John got it right, that this is what Jesus was really like, then the case can be made that our exaggerated hero was sometimes a real jerk. This becomes obvious when we read John 11 without rose-colored glasses. How can even the most pious Jesus fans not be taken aback by the story of Lazarus in this chapter? This is one of the most famous episodes in the gospels, with one of the most stupendous miracles. Yet Matthew, Mark and Luke, writing much earlier, somehow never got wind of it. The shortest verse in the Bible (at least in most English versions) is here, verse 35: “Jesus wept,” and of course, this gets a lot of mileage as proof of Jesus’ compassion. But that’s not quite the whole story: Jesus knew that Lazarus was sick—he received a message from Lazarus’ sister—but delayed going to his bedside. He let him die so that he could pull a stupendous stunt to boost his own reputation and get people to believe! John makes this explicit in verses 14-15: “Then Jesus told them plainly, ‘Lazarus is dead. For your sake I am glad I was not there, so that you may believe. But let us go to him.’” He’s glad he wasn’t there? Please, if you’re going to take this story at face value, then admit that this is obnoxious behavior. And, in fact, Martha, Lazarus’ sister, gets in a zinger, upbraiding Jesus for his neglect. If you’d been here, Lord, he’d be alive. Sure, yes, I believe you’re “the Messiah, the Son of God, the one coming into the world” (11:20-27). When Mary arrived on the scene, she also complained, (v. 32): “Lord, if you had been here, my brother would not have died.” Maybe even John himself sensed that Jesus had been callous in not showing up sooner, and thus makes a point of telling his readers how upset Jesus was that Martha and Mary were distraught: “When Jesus therefore saw her weeping, and the Jews also weeping which came with her, he groaned in the spirit, and was troubled. And said, ‘Where have ye laid him?’ They said unto him, ‘Lord, come and see.’ Jesus wept” (11:33-35). This was a voice-activated resurrection (11:43-45): Jesus “cried with a loud voice, “Lazarus, come out!” The dead man came out, his hands and feet bound with strips of cloth, and his face wrapped in a cloth. Jesus said to them, ‘Unbind him, and let him go.’” We are not told if Lazarus was as annoyed as Martha and Mary had been that Jesus had let him die. Don’t forget that this is the gimmick of the Fourth Gospel: the promise, made repeatedly, that the faithful will get out of dying if they just believe. David Madison was a pastor in the Methodist Church for nine years and has a PhD in Biblical Studies from Boston University. His book, Ten Tough Problems in Christian Thought and Belief: a Minister-Turned-Atheist Shows Why You Should Ditch the Faithwas published by Tellectual Press in August.